Families are welcomed in our vacation rentals. Student groups are not permitted. Our minimum age requirement to rent is 25 years old. Everyone in your party must be 25 years old to check in unless accompanied by a parent. 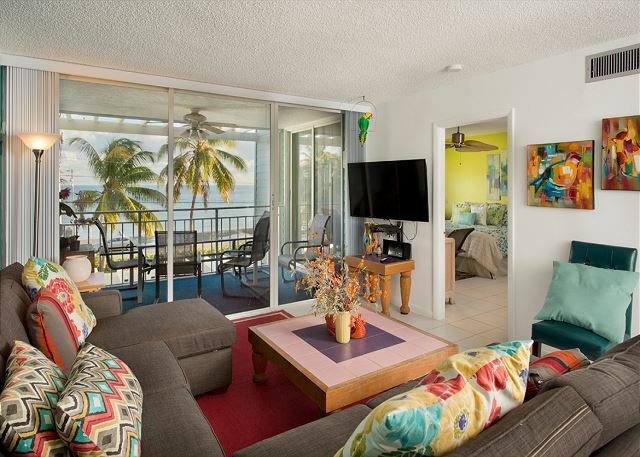 Bright, tropical colors and tile floors provide an island ambience to this two bedroom, two bathroom ocean view condominium. The living area and master bedroom both open onto the private balcony and create a relaxing indoor/outdoor place to unwind at the end of your day. 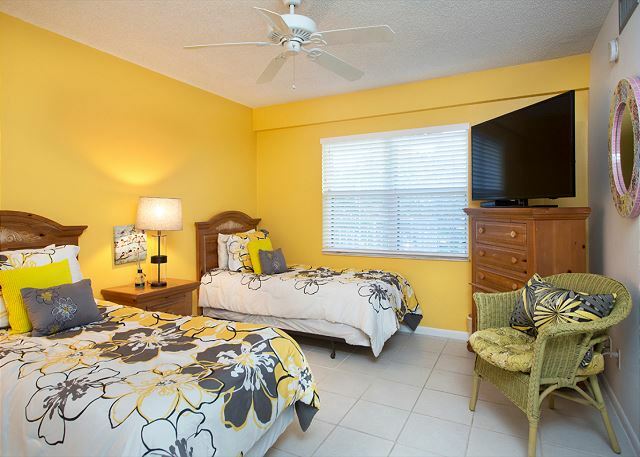 Or enjoy the lush grounds with tennis courts and twenty-five by fifty foot heated pool. Hello Andre, Glad you enjoyed your stay! Location was great, wonderful view, very clean and cute. This was our first experience and did not regret it! Felt at home and comfortable. Much better than a hotel. The other residents were friendly and helpful. The pool was clean and we had no problems with the property. All our questions were answered before we arrived and knew exactly what to do. You do need to drive to reach restaurants and entertainment but that was not an issue for us. Hello Wayne, Thank you for your review. We greatly appreciate it. Hope to see you again in the near future. Hello Linda, Glad you enjoyed your stay. Come back to see us soon. This condo is in the perfect location. 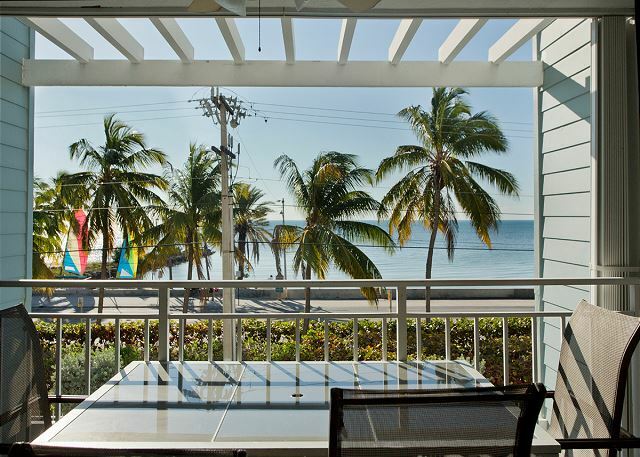 It is across from the best beach in Key West and is an easy bike ride to anywhere on the island. The condo is a little worn and could use a few items either repaired or updated but these things are not enough to not stay here. The rental agents are very responsive to problems. Hello Nancy, Thank you for your continuous repeat business. See you next year. CONDO WAS AS STATED IN ON THE WEBSITE. CLEAN,COMFORTABLE,CONVENIENTLY LOCATED. THE ONLY PROBLEM I HAD WAS HAVING TO DRIVE HALF WAY ACROSS THE ISLAND TO PICK UP AND DROP OFF KEYS. DID FIND SOME ANTS AS WELL. Hello Linda, We are glad you enjoyed your stay. Hope to see you again soon! 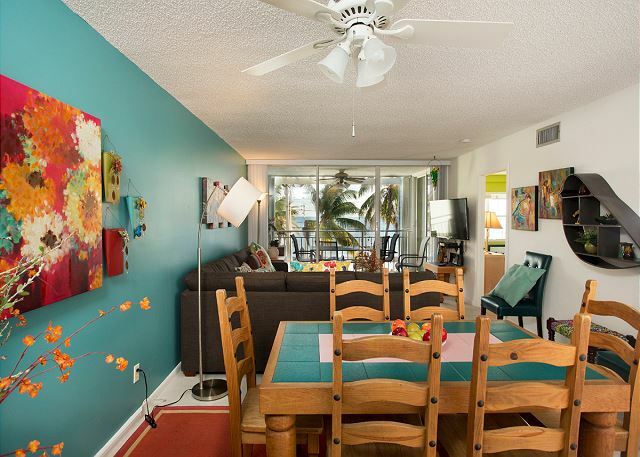 This is a very comfortable condo and the perfect location if you want to be on the beach. The La Brisa amenities are good - pool, tennis, gas grills and picnic area. Hello Nancy & Joe, Glad you enjoyed your stay. Walsh family of four adults spent 7 days sightseeing and SCUB diving in the Key West area. Our stay at Labrisa was excellent. Just the right location for our activities. The condo exceeded my expectations after reading prior reviews. I am assuming there were updates made recently. I only had two complaints. The toilets could be replaced, and the second bedroom had two beds that were uncomfortable and too small for an adult. Hello Bret, Glad you enjoyed your stay. Thank you for your feedback we greatly appreciate it and will pass it on to the owner. Hope to see you again soon. If you want to be near the best beach in Key West and out of the Duval Street action then this is the place to be. The Duval area is an easy bike ride away as is everything else on the island. The condo is lovely and well equipped We had a couple of minor problems and the management company handled them immediately. We will stay here again. Hello Nancy, Glad you enjoyed your stay. See you again in 2015! The location was great, Smathers beach is awesome and right across the street. we were a short bike ride from everything. The rental agency was great and very responsive. The unit itself is in real need of update and repair of minor things like doors, windows, blinds etc that don't work properly. One toilet did not work when we arrived but the management fixed it immediately. The other was flushing very slowly so we avoided it. Plumber also came to fix the ice maker. Bed was relatively comfortable, but not great. So the unit gets low grades, management high grades...and the view a 5+. We didn't spend much time in the 's Key West and we had a wonderful time. We were very happy with our condo. Everything was neat and clean. Living room furniture was outdated but would not stop from returning. Loved our stay, but the furniture was out dated in the living area, blinds did not operate, closets were difficult to open and close. Hello Julie, Thank you for your feedback, we appreciate it. We will advise the owner of your suggestion, and we will address teh blinds and closet doors immediately. Look forward to having you stay with us again soon. a guest from N North Myrtle Beach, SC does not recommend this vacation rental. We (2 couples) rented E205 LaBrisa for a week. I liked the location and the overall complex. This particular condo is getting pretty shopworn (e.g. blinds wouldn't work properly; furniture, doors, & locks were showing wear) and was dirty when we arrived. We asked for it to be cleaned and it was - very well-done. KWVP was very responsive. While not awful, this was the worst of 3 rentals we've had in KW. We have stayed at La Brisa 205E for two holiday vacations now. We love the easy acces to Smathers Beach and the location. The only complaint is the furniture is very outdated and the leather couches have become very sticky from the humid conditions, but we would still rent this condo in the future. We wanted something very near the beach and this location was perfect. Grounds and pool were beautiful. Unit was comfortable and clean, but could use some maintenance (none of the doors that slide worked). Overall I would certainly stay here again. Hello, Thank you for your feedback we greatly appreciate it and will address them as soon as possible. 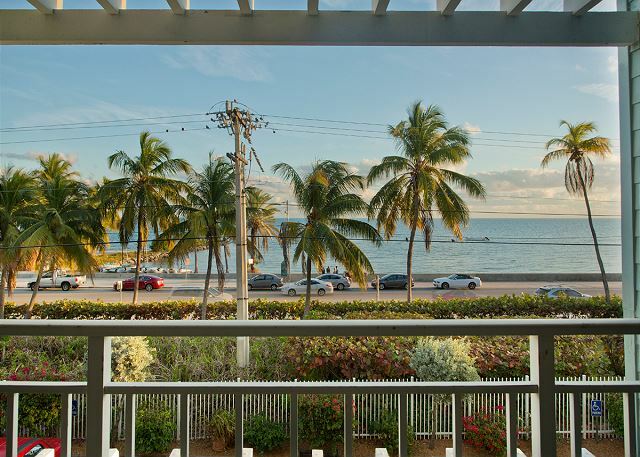 Look forward to assisting you in your future stays to Key West. View & location were great. Two bathrooms great feature. Very pleased. The only suggestion going forward would be a CD/radio player that worked & if it were my property a flat screen tv. We had a great stay at our unit - it overlooked the ocean and beach and we were able to go out each morning to walk the beach. People were very friendly and we would return to this unit again.